Part Number ADQ56656401 replaces: 1462822, ADQ56656401, ADQ56656401, AP4457244. The lint filter is designed for use in your dryer. The function of the lint filter is to catch lint and debris during the operation of the dryer. If your old lint filter is old or damaged, or there are marks left on your clothes at the end of the dry cycle, you will need to replace it with this part. This part is approximately 12 inches in width by 11 inches in height. Many of our customers have rated this repair as very easy. To complete the repair, simply remove the old filter, clean up any remaining lint and debris, and install the new filter. NOTE: As per manufacture - due to a redesign you MAY also have to change the cover and filter guide. I am trying to find a lint filter for my LG dryer, but when I looked for the above model number I got a message that said the one they listed would work with my dryer. Yes? Or no? Hello, Thank you for contacting us. I have researched the model you have provided and have found the part you’re looking for is PartSelect Number PS3531962. They also suggest replacing the cover and the guide at the same time due to a redesign of the filter. Part # for Cover is PS3534930 and Guide is PS3535278. Hope this helps! The removable lint filter has warped at one end and periodically can catch clothes as they spin. What part number(s) do I need to replace this filter. Looking at some posts it seems that depending on the model it's recommended you also replace other parts as well because of a redesign. The serial number on my dryer is sn904kwta00033. Will i need to replace anything else when replacing a warped lint filter? Hi Ernest Jr, Thank you for your question. No, you should not need to replace anything else. I hope that helps. Good luck with your repair. I need a new lint filter (cracked) do i need a new filter guide the existing one is fine. What is the difference from the guide and cover? Hi Gary, Thank you for your inquiry. I your filter guard is fine then you do not need to replace it. The guide is the part where the lint filter goes into and the cover provides protection for the filter. I hope this helps. Thank you and have a great day! I need a new dryer lint filter. What part # do I use? And do I need to buy new housing for this filter to fit dryer with s/no:604kwhx2m481? Hello Loretta, Thank you for contacting us. I have researched the model you have provided and have found the part you’re looking for is PartSelect Number PS3531962 for the filter and as per manufacture due to a redesign you also have to change the cover and filter guide.Part # for Cover is PS3534930 and Guide is PS3535278.Good luck with the repair! Hello Dennis, Thank you for your inquiry. 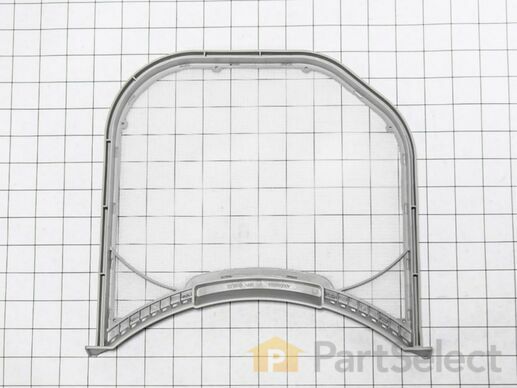 The part number for the lint filter is ADQ56656401, the part number for the drive belt is 4400EL2001F, and for the drum rollers, the complete assembly with the shaft and retainers is part# 4581EL2002C, for just the roller the part number is 4581EL3001E. Hope this helps! I already ordered a part from seneca river and it was too wide. It looks like from description your part is exactly the same size? Hi Roxanne, Thank you for the question. According to the model number provided,the lint filter is PartSelect Number PS3531962. As per manufacture - due to a redesign you may also have to change the cover and filter guide.If this filter is to wide for the cover and guide on your appliance now these parts will also have to be replaced. Part Number: PS3534930 and Part Number: PS3535278. Good luck with the repair! In addition to the lint filter being broken, the area/part on the dryer that the lint filter slides into is broken. Does ps3531962 include all this? Hi Dion, Thank you for the question. The filter is sold separate from the parts it fits into. There are several parts to make up the area the filter fits into. There are two parts tot he cover, Part Number: PS3534930 and Part Number: PS3648317. The filter guide, Part Number: PS3535278 and the duct, Part Number: PS3526484. The covers and guide are around the top of the filter and the duct is the lower part the filter sits in. Hope this helps! We just bought our brand new dryer and it came without a lint filter. Can you tell me what model lint filter i need?? Hello Scott, thank you for your question. The lint filter for your appliance is PartSelect Number: PS3531962. Please enter the part number into the site for current price and availability. Good luck with your repair! Hi..i want to purchase a new lint filter for my dryer. it says you have the part but i have to change the filter guide as well? is that something i need to purchase? i've had this dryer for at least 4-5 years. thank you. Hello Dana, thank you for your question. Yes, the filter is part number ADQ56656401 and you do have to change the filter guide as LG has made changes to the filter and it need the corresponding filter cover and guide. The cover is part number MCK49049101 and the guide is MEA49050001. Please enter the part number into the site for current price and availability. Good luck with your repair! I bought the three parts that were suggested and it worked perfectly. The lint filter for my Lg was discontinued and I had bought one that didn't quite fit and ruined a lot of my clothes. I had to buy the lint filter, the part where the lint filter goes in and the one that connects to the sensor. They changed the design so I had to buy all the parts around the filter but that will save on ruined sheets and cloths that were getting hooked on the old filter. Also gave me an opportunity to vacuum out the lint. Works as well or better than the original. Exact fit for our machine. The ordering is made very easy to select the exact part that fits the needs of your dryer. Exact part I needed—perfect fit. Part arrived quickly—no problems. The part came fast and fit better then the original!